More school posts? Ah yes, unfortunately we are still in full swing until the last day on June 25th. Our town's school year started after Labor Day because of budget votes and we had way too many snow days. Next year we are starting after Labor Day again, which affords us a late August vacation, but another school year ending in late June. But more interestingly and importantly, is that Adam is getting extremely good at math. Lately, Adam has been telling us that he has been doing third grade math at the end of first grade. Without actually looking at his work, we nodded and praised him. 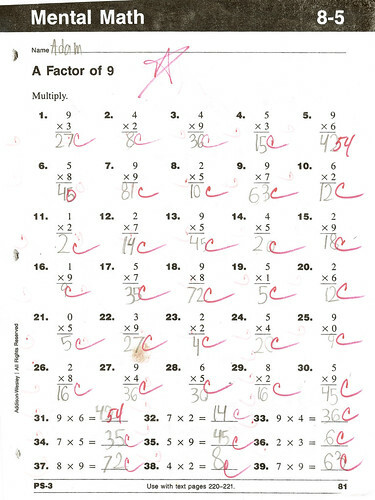 And then he brought home this multiplication worksheet. Now, we've only explained the concept of multiplication, and covered two's and some three's, but not much beyond that. We were completely astounded that he got most of this worksheet for nine's right. I asked him whether the teacher explained multiplication and showed him a multiplication table. He said no, and that he figured it all out on his fingers. Fingers? Seven times nine on fingers? Even I would get that wrong! Wow! We asked if anyone else in his class was doing third grade math and he said no. So our little boy genius is well on his way to becoming a math geek, just like his mom. I found a nice multiplication table for him to memorize over the summer and blow away his second grade teacher as well. We are extremely proud of you Adam! Edited to add 6/18/08 - I since learned that what he meant by "doing it on his fingers" was that he was doing the multiply by nine's trick where you hold out your fingers, fold down the finger that you're multiplying by, and then count the remaining fingers to get your answer. For example, for 9 x 3, fold down the middle finger of your left hand, and you have 2 and 7 fingers showing, or "27". I explained this to him a long time ago, although he claims he figured this out himself.